Please be advised. It is not in my gift mix to come up with creative gifts and projects, so please don’t expect this sort of post to be happening again any time soon. In fact, the only reason I’m doing this post at all is because I had an idea, and I’ve had several people ask me how to recreate it. So, read on to find out how you can permanently encourage someone with a simple gift. My husband’s birthday was coming up and I wanted to do something for him that let him know how loved and appreciated he is by the people in his life. I wanted him to see the kind of impact his life has had, and is having, on others. So, I took a concept he uses in his ministry to encourage others and morphed it into something he could hang on his wall in his office. Usually, by the end of the experience, everyone in the room walks away touched by the love just a few words can share. Tears are not uncommon. Life and purpose have been spoken and received and that in itself is a huge blessing. The final step was to take this image and have it printed on canvas so that he could display it in his office. 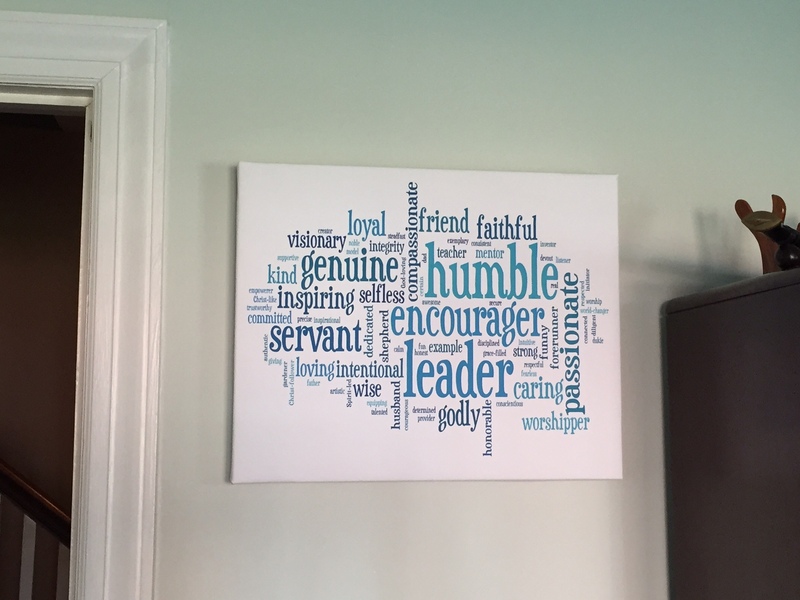 Now, every day at work, my husband is reminded of how God is using his life to impact others. It’s simple really, but with a gift like this it becomes just a little bit harder to believe the lies the enemy tries to sell us. It becomes just a little bit easier to believe that God has called us to a specific purpose and that we can utilize what he has given us to live for something a little bigger than us. Thinking of a person who could benefit from this? Getting started on Christmas gifts? Here is where I give you the steps of what I did. Take them or leave them. Put your on twist on it. Maybe you could do a painting. Perhaps a collage or scrapbook. Or steal my process. Whatever you do, I’m sure it will be received with much gratitude! Create a list of words. Include all repeated words. If necessary, download java as it is required to use the program. Now you get to play around with the font, layout, and color of your words. Once you’ve found the perfect display of your words, click “Open in Window”. Save the image, crop as necessary, and you are ready to have it printed! I took mine to be printed on canvas at Office Depot. If I had more time, I would have had it printed by a professional photographer or sign company. A professional will cost more and could take several weeks. A place like Office Depot, CVS, or Walmart can get it done in a day or two for a lot less money, but the quality won’t be as good. Your choice! Note: I chose to use wordle.net, but another popular site is tagxedo.com! Have fun! I would love to see any images that you create! When you did this for Eric, I loved the outcome and thought it was so powerful and a permanent encouragement for him. I would love to do this for Ron for Christmas or even his birthday. If I do this, I may need your tech help! If you decide to do it, I would be happy to help! My sister made a smaller versions of something like this for me, during a dark period of my life. I treasure it far above anything she could have ever purchased. What a thoughtful gift from your sister! Words like these can make such a positive impact in someone’s life. I love that you treasure it so much! I bet they would love it! Words of encouragement from mom are always extra special :).